Eruviel delighted in the relative quiet that the Scholars Stair offered. Having no commissions that day, she decided to relax in the sun. Letting out a deep sigh she sank further back in her seat, sharpening her dagger as she let her mind wander. She had slept very little the past two nights. 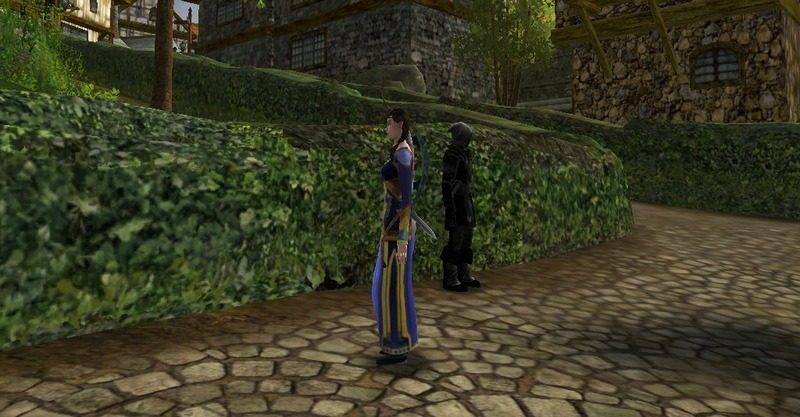 Even after speaking with the leader of the Bree-town Watch about her encounter her mind had been restless. As much as her mysterious assailant intrigued her, she worried about others being caught in the cross-fire. Sleep had almost taken her when she was startled back to the present by a sickening thud. “By the Valar,” she mumbled angrily under her breath. Rising to her feet she slung her bow over her shoulder as she made her way to the stone railing. Fifteen feet down laid the body of a man, lifeless in a pool of blood. You fool! she chastised herself as she slammed her dagger back into its sheath with frustration. It was then that she noticed the man walking slowly away down the wooden walkway. Of all my unlucky weeks, she mused to herself. She did not like to gamble, but her horse was stabled in the directions he walked. Shifting her dagger amidst the folds of her flowing blue skirts she began to walk casually in the same direction. Without seeing his masked face she knew it to be the man from the other night, though he looked taller than she remembered. As they walked down the way with a mere twenty feet separating them, Eruviel thought over what she should do. There was nothing she could do combat wise. She had just gotten the dress mended a month earlier and did not want it ruined for good. She had wanted to speak with him again . . . though she assumed, under the circumstances, her options would be less than favorable. Proceeding with caution not being an option, Eruviel strolled around the corner of bushes and began to head down the road to the West Gate when she sensed him. He snuck up on her much like he had the night before, but this time she was a little more prepared. As the man’s dagger appeared hardly an inch from her throat, Eruviel grasped his wrist with her left hand, having decided against drawing her own blade. She could hardly fit her nimble hands around his wrist and her stomach twisted as she came to the sudden realization of just how much bigger than she he was. “None of your business,” he said, the danger in his voice thickening as he stared coldly at her from behind the black mask. Eruviel ‘s emerald eyes darkened as she looked up at him. “If you were doing this outside of town, in the hills and along the roads I would be killing them with you. But there is a different law in town, and justice is not ours,” she said in a fierce whisper. The man smiled slowly. “I will see to it the the children of this town are safe. . . along with their family’s. . . even if it costs me my life.” He moved his arm and Eruviel released her hold on his wrist to watch him sheath his long knife. His comment surprised her, but she simply nodded curtly. “That was my first concern. I would not want to have to fight you over the life of an innocent,” she said, giving him a wry smile. The man’s face darkened. “You won’t. . .” He stared into her eyes for several moments before adverting him. “I am here to help not hinder,” he said firmly. Curiosity clawed within her. Eruviel smiled slightly as she took a small step back. “I cannot promise that I will not keep following you if you kill near me again . . . but I cannot say that I do not . . . admire your cause in some way. Though, if we do . . meet again, I would prefer to not have a knife to my throat.” I will need to be more vigilant, she thought. I would rather have his victims behind bars than painting the streets with their blood. The man nodded. “I do not make promises I cannot keep.” He cracked a smile but his face went dark again. “If the Watch gets in the way. . . I will have no choice but to . . . .” His voice trailed off. Eruviel meet his eyes again. “You always have a choice, my dark friend,” she replied, her rich, elvish accent seeping into her low, stern voice. The man meet her eyes. “I have to do this.” Eruviel’s heart beat sped up, from what she could only attribute to being a moment of fear, as he drew closer to whisper this time in a normal tone of voice. “I do not want you to get caught in the middle of this,” he said before again stepping away. Eruviel let out a musical laugh. “Oh, but it seems I already am, heruamin. You could have let me pass the other night. You could have killed me, but even now it seems I will not die wearing my second-best.” Giving him a thoughtful look she began to turn to walk away.